Oh so decadent! 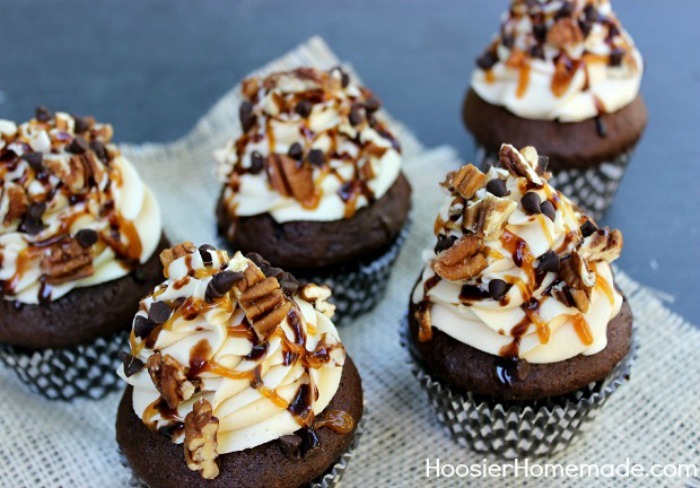 These Chocolate Turtle Cupcakes are made with Salted Caramel Creamer and topped with Caramel Buttercream Frosting. 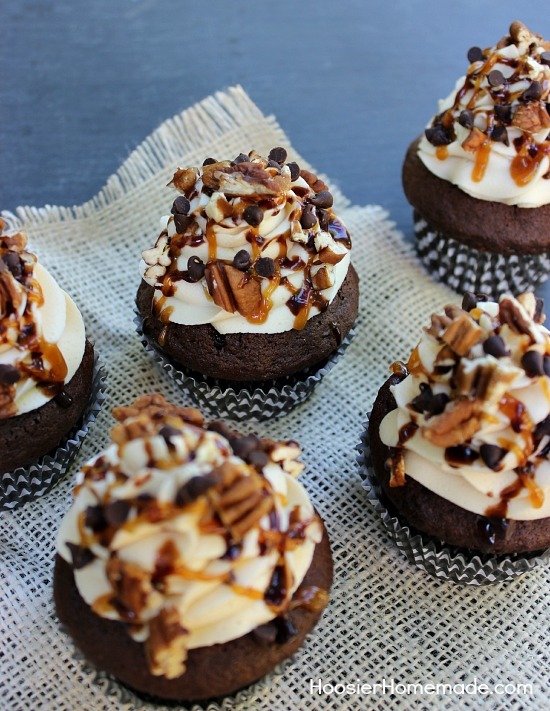 Drizzled of Caramel Topping and Hot Fudge, then sprinkled with mini chocolate chips and chopped pecans. And you guessed it…they are easy! There are many flavors of cupcakes that I adore. But when I bake Chocolate Cupcakes, they almost always go straight to the top of my favorite list. Turtle desserts all started with a candy from the early 1900’s, Turtles. These delicious treats are made with pecans, that are coated with caramel and dipped in rich chocolate. And the Turtles Candy has been transformed over the years and made into delicious desserts, like Turtle Cheesecake Pie. Starting with a Devil’s Food cake mix, I added International Delight Salted Caramel Mocha Creamer in place of the milk or water. And the usual eggs and oil. For the frosting, I started with my Buttercream Frosting recipe and added caramel topping. Super easy and delicious! 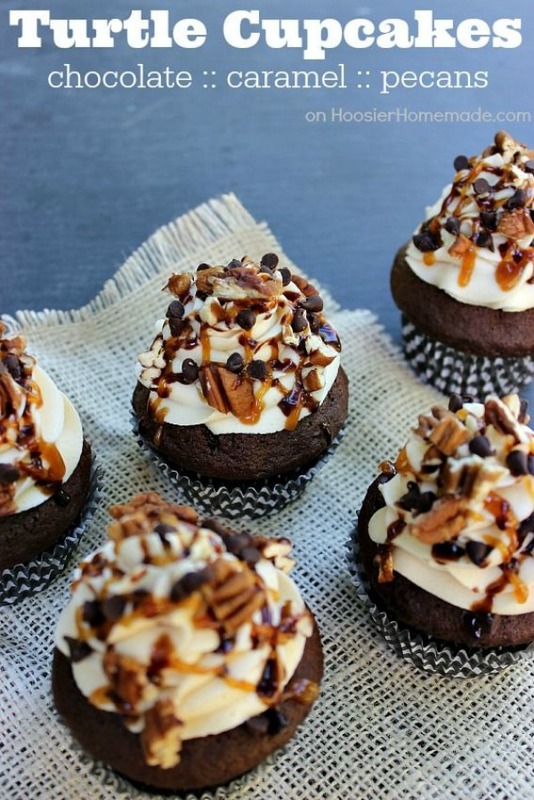 A drizzle of Caramel Sauce, Homemade Hot Fudge Sauce and a sprinkle of chopped pecans and mini chocolate chips tops off these Chocolate Turtle Cupcakes. Do you love the flavors of Turtle? 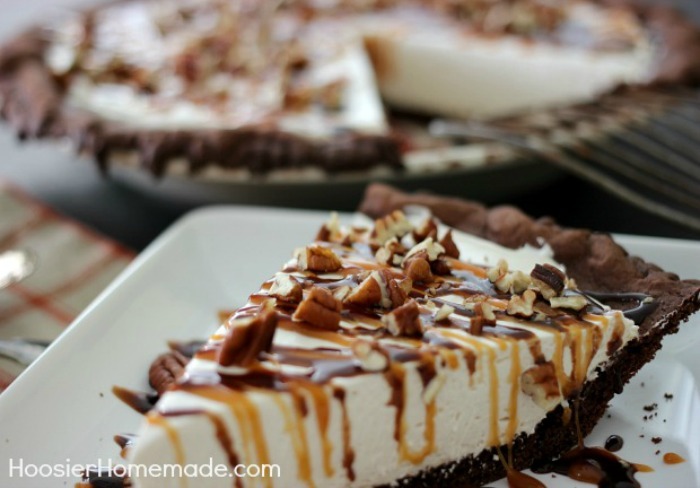 You may also like my Turtle Cheesecake Pie! 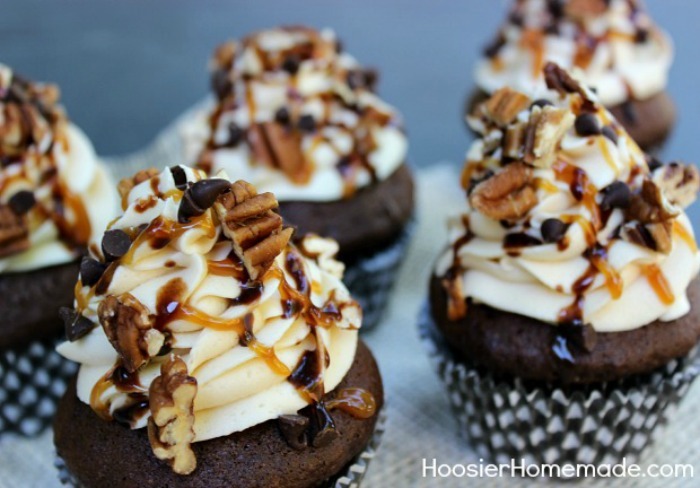 Join us over in the Cupcake Chronicles Facebook Group. It’s open to everyone, so please join us over there to share your cupcakes, ask questions and chat with other cupcake lovers! Hello! If my box mix calls for 3 eggs should i still use 4 like the directions state?! Thank you! Hi Haley, yes I always use 4 eggs, be sure they are room temperature. You can add them to a bowl of hot water for a couple minutes to get them room temperature. Delicious cup cakes ! How long will the icing keep? Should I keep it in the refrigerator since it has milk in it? Hi Sandy, yes keep the frosting in the refrigerator. If the frosting is NOT on the cupcakes, it should last about a week in an airtight container. You will need to bring it to room temperature before frosting the cupcakes. Can I prepare these without adding shortning? Hi Deanette, yes, any type of frosting is fine. You can use all butter if you like. Then just add the caramel topping. I could definitely go for one of these babies right now!! Thanks for stopping by Beth! It’s definitely hard to eat just one!